I don't have a circular image that is large enough to cover the "medallion" area so I made a 3x3 inch card. 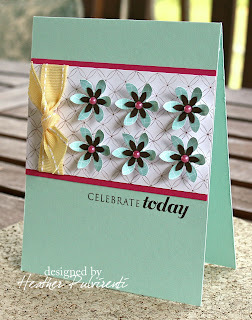 I used an Inkadinkado image that is actually two stamps - the daisy and the outer circle. 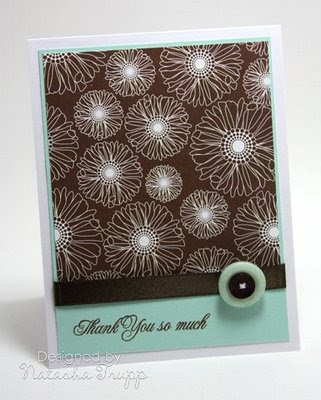 I used Memento Rich Cocoa dew drop on the center of the flower and Memento Dandylion on the petals. The outer image was stamped in SU! Oled Olive. The sentiment is from PaperTrey's Friends Til the End set. 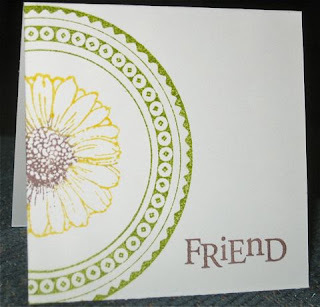 Then I got an idea to use one of my larger stamps on an A2 sized card. I traced the bottom of a container on the front of the card. 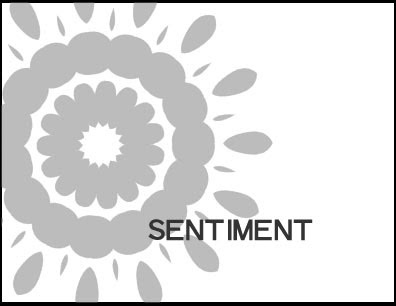 Then I masked off the perimeter of the half circle and stamped the image from PTI's With Sympathy set with SU! Old Olive . I stamped it several times to get coverage within the circle. 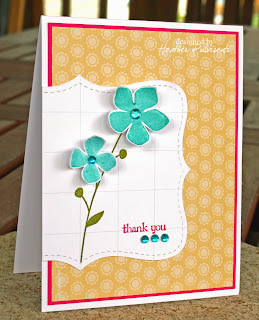 I then stamped the flower from the same set with PTI's Enchanted Evening ink. After removing the mask I stamped the sentiment in Enchanted Evening ink. Supplies: Stamps - Inkadinkado, PaperTrey; Ink - SU! Old Olive, Memento Rich Cocoa, Memento Dandylion, PTI Enchanted Evening. Hello everyone! It's time for another clean and simple fall to layout. This week I kept it uber-simple. I'd be lying if I said the sketch wasn't slightly inspired by the fact that I just got the cool background-esque stamp "Medallion". It's such pretty image. I thought I'd go with elegant theme here. I went with a gold, chocolate, and cream colour scheme. 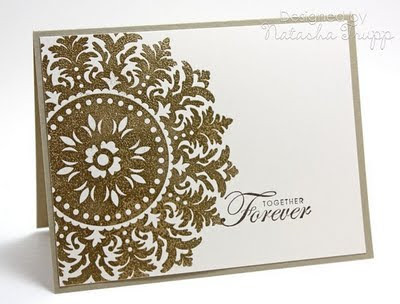 To keep things fancy I embossed the Medallion image with gold embossing powder. Happy Tuesday! 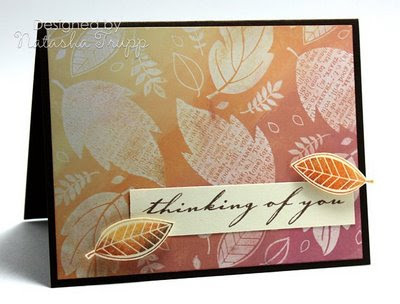 This is the card I created using the most recent Fall-to Layout. 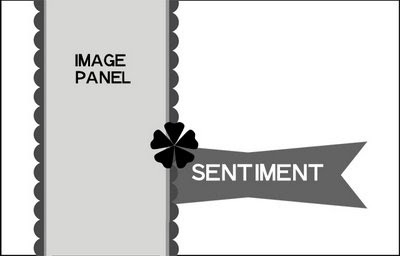 It's a little hard to tell in the photo, but the sentiment strip has a little wave to it. I made this card out of desperation! I could not think of how to use the color combination that was a challenge in the SCS Dare to get Dirty (DTGD) forum. The colors were real red, more mustard, and bashful blue. So I finally decided on this graphic design made with PaperTrey's Polka Dot Basics. 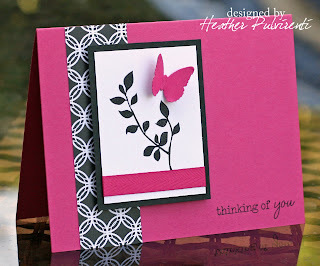 The sentiment is from PaperTrey's Shapes by Design. Totally a CAS card and made in under 10 minutes!! I just returned from a nice, but brief holiday to Toronto. I am slowly getting to all the amazing sketch challenge cards from weeks past. I try to comment on them all. I returned home to a Papertrey Ink parcel with a few of the latest releases. I couldn't resist ordering the Everyday Button Bits set. 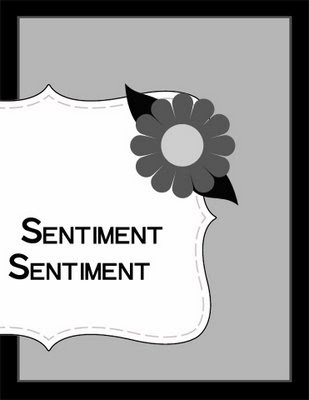 There are so many cute images and sentiments in the set. I decided to make an ultra simple card with the hot air balloons and some buttons in primary colours. 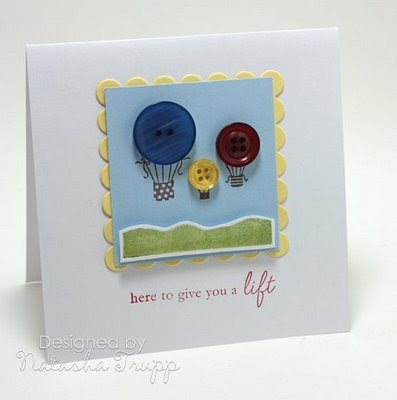 I stamped the ground and cut it out, placed that on the blue "sky" background, added the balloon baskets image and chose my buttons. 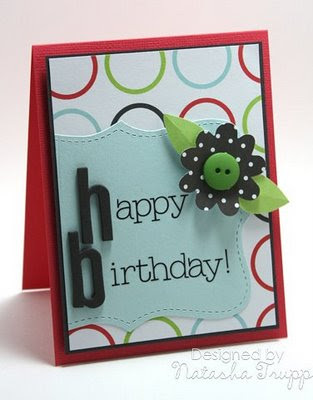 Finally I added a scalloped mat and a greeting. Wow a year's worth of sketches is amazing! I am so thankful to Natasha for starting this blog and then letting me be apart of it! 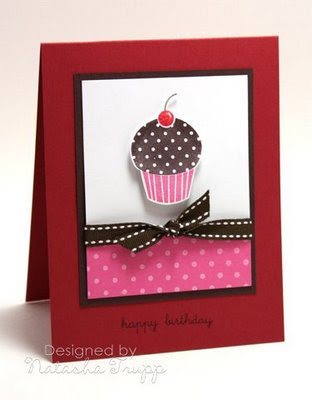 This card includes some Dare to Get Dirty (DTGD) challenges from Splitcoast Stampers (SCS). I used Memento Summer Sky and PaperTrey (PTI) Enchanted Evening inks on the silhouette flowers from PTI's Life stamp set. I matted that panel with PTI's Spring Rain and Enchanted Evening card stock. 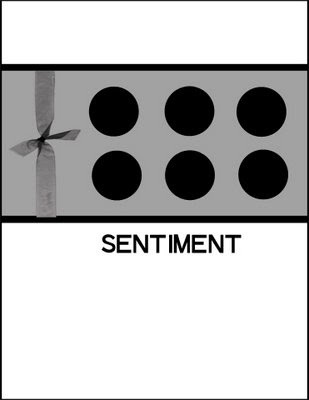 The sentiment, ribbon and button are all from PTI. Supplies: Stamps - PaperTrey Life; Ink - Memento, PaperTrey, Paper - PaperTrey; Misc - Ribbon, button, LI embroidery thread, EK Success border punch, dimensionals. It's official, I finally have a year's worth of sketches (although I posted the first sketch back in May 2008). It's kind of fun to reflect back a bit. At that point, the blog was very new. 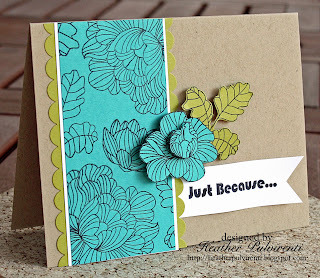 I started it because I had always sampled stamping styles, but finally found one that fit and that I knew would stick. I am so glad that so many people seem to enjoy this style too! Thank you so much for visiting! And here's my version. I vaguely recall that the inspiration for this sketch had a card featuring a bird cage. 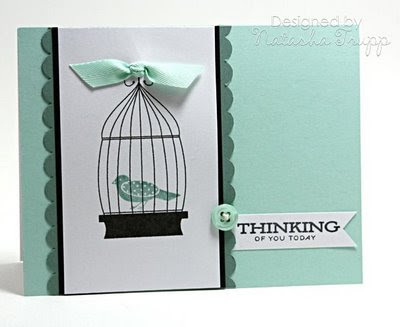 I really wanted to include a bird cage on my card, but was less than impressed with what I had in stamps. So I got to work in FreeHand and drew this on the computer. I printed it out, then stamped the little bird from Everyday Classics into it. I was in the mood to try the doubled up button look. 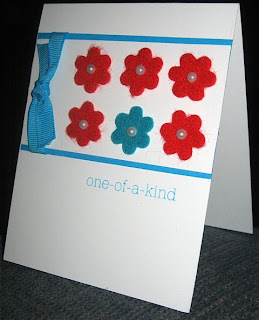 I grabbed two buttons, stitched them together, then pieced together the card to match! I don't usually do a lot of distressing on my cards but for some reason I thought this one needed it! After I cut out the Labels 2 die I stamped the sentiment and then scored the entire label. Then I used Versamagic Spanish Olive to distress the edges. Then I thought the main background dp needed distressing too so I used my MM edge distressor. I made the flower with 2 CB die - they green leaves are really petals from one of the flower die I have. I threaded some of the dp through the button then attached it with a glue dot to the center of the flower. I bent of the leaves for more dimension. Supplies: Stamps - Verve; Ink - Versamagic; Paper - PaperTrey Ink; Misc - Scor-pal, CB die, Button, Spellbinders Label 2 Nestabilities. Wow, I love it when my post publishes and there's nothing in it, lol! I just love the color combo in the new SU Thoroughly Modern dsp, so I used it here. I just recently purchased Together Forever and coordinating wheel (which is no longer a wheel, but a background strip mounted on EZ Mount...). I love the floral images in this set. The mix of fonts is quite nice too. 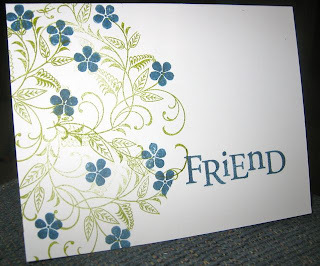 I started by stamping 6 flowers on white paper and punched those out. 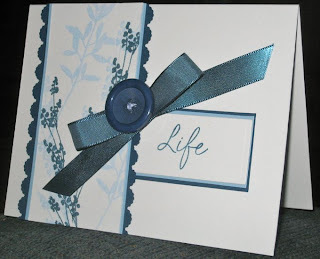 Next I stamped the background paper and added the ribbon. Be sure to add the ribbon before the 6 circular elements, that way you have a guideline. 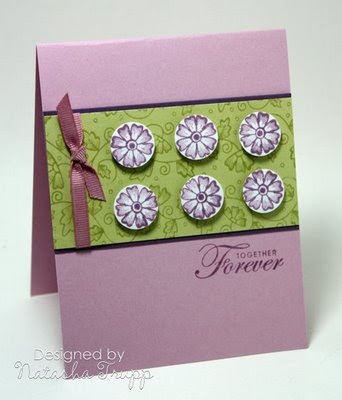 I attached the flowers with pop dots then added my sentiment to the card base. 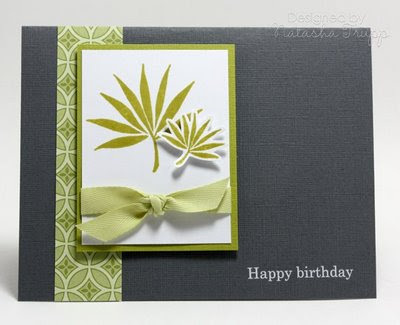 Because of the punching and background stamping, this was quite a quick card to make. Hi everyone! I can't begin to tell you how excited I am that I was asked to be a contributor for the weekly sketches. :) I found my way to this awesome blog via Becky's blog 4 months ago, and have been hooked ever since. I *love* sketch challenges, but sometimes I find myself having to sit them out because I can't find a way to make them fit my style (LOL, whatever that is!)... I never feel that way with the sketches posted here every week. You can keep them CAS or you can dress them up a bit, and I love that! Here is the sample I came up with using the Fall-to Layout #49 sketch. I stayed pretty true to the sketch that was provided, the only changes being that my strip of patterned paper is 1 1/4", and I didn't tie a bow with my ribbon. I figured since I'd be home from work early, I would upload a later 10 minute Monday. The card construction was very basic. I stamped the larger leaf on the main panel, stamped the smaller leaf on scrap white cardstock and cut it out and attached with a pop dot. 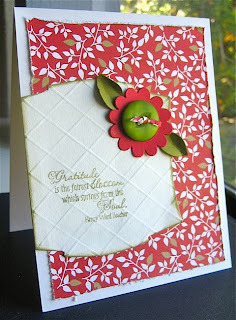 Then I tied on the ribbon, attached the patterned paper and rub-on to the card base, then pieced the rest together. 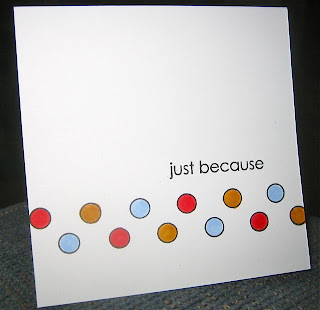 This is a birthday card for my BFF. 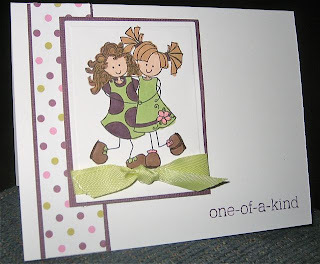 I received this image from one of my stamping friends - I think these girls are so cute. I colored them with SU! markers and cut and embossed the image with my rectangle Nestabilities. 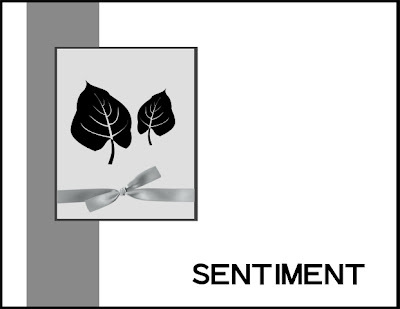 All papers are PaperTrey as well as the ribbon and sentiment. 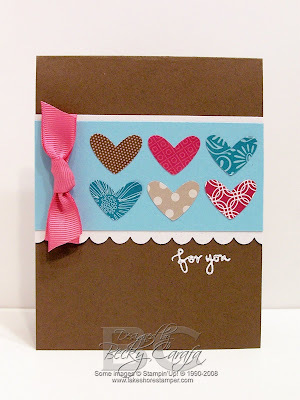 The main image is from Stampingbella. Supplies: Stamps - Stampingbella, PaperTrey; Paper - PaperTrey; Misc - SU! markers, Ribbon, Dimensionals, Nestabilites.